We made this delicious noodle dish for the Chinese New Year. Hopefully it will bring us luck in the coming year! I made this dish with lots of vegetables and a light sauce. It was so good, and also perfect for my noodle loving son. I made it vegetarian, but shrimp or chicken would be a great addition too. 1. 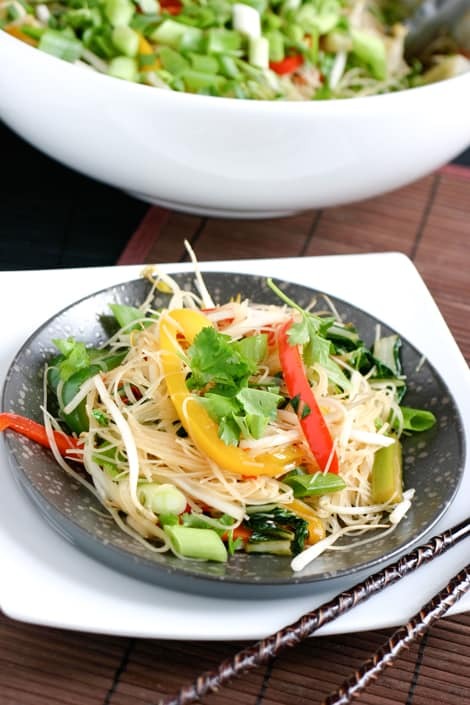 Place rice noodles in a large bowl. Cover with hot water, and let soften for about 20 minutes. Preheat large skillet or wok. Add bell peppers, carrots, and celery. Stir fry until softened. Add grated garlic, ginger, sugar, soy sauce, sweet chili sauce, and oyster sauce. Add bok choy and mix until well combined and bok choy is wilted. 2. Drain noodles and add softened noodles to wok and mix well. Add bean sprouts and toss. Move to a serving platter and top with fresh cilantro and fresh green onions. Hi. Glad to have found your website-love the photos and recipes! This noodle dish looks so good, especially with the cilantro which I love. I think I even have most of the ingredients, so I will be making this soon!